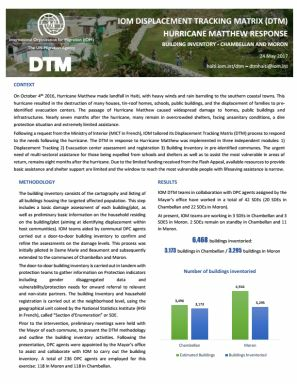 DTM carried out assessments in displacement sites between 13 and 16 April 2018. 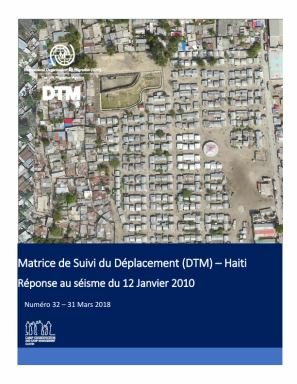 This document contains maps of the displacement sites hosting IDPs displaced by the 2010 earthquake, including information on the number of displaced people in each site. The Border Monitoring Network focuses on the identification and profiling of persons crossing the Dominican-Haiti border as well as supporting the management and provision of assistance to vulnerable individuals. 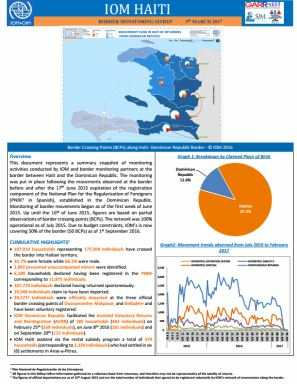 During the reporting period 2,341 individuals were observed crossing into Haiti. 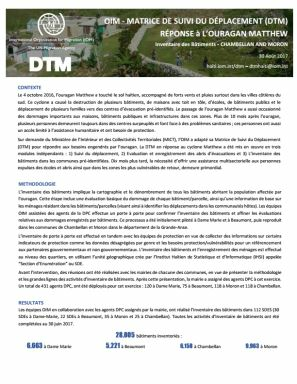 Ce rapport contient les résultats des enquêtes sur les intentions de retour effectuées dans 26 sites de déplacement dams les communes de Les Cayes, Camp Perrin, Maniche, Port-Salut, St Jean du Sud, Arniquet, St. Le 4 octobre 2016, l’ouragan Matthew a touché le sol haïtien, accompagné de forts vents et pluies surtout dans les villes côtières du sud. 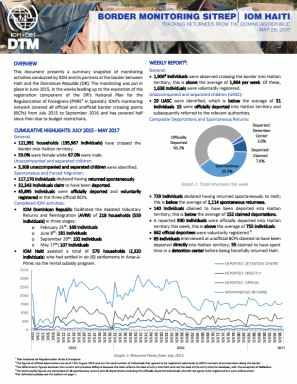 During this reporting period 1,278 individuals were observed crossing the border into Haitian territory; this is below the average of 1,867 per week. 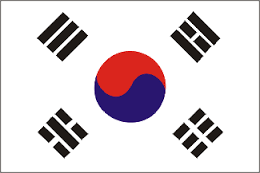 Of these, 1,120 individuals were voluntarily registered. 58 UASC were identified, which is above the average of 32 individuals. 1,906 individuals were observed crossing the border into Haitian territory. Of these 1,638 were voluntarily registered. 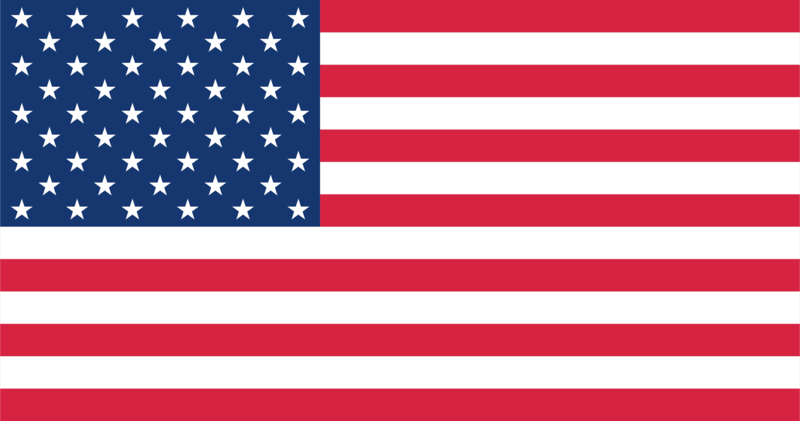 29 unaccompanied and separated children were identified, 15 of these were officially deported into Haitian territory. On October 4th 2016, Hurricane Matthew made landfall in Haiti, with heavy winds and rain barreling to the southern coastal towns. During the reporting period 1,858 individuals were observed crossing the border into Haitian territory. Of these, 1,028 were voluntarily registered. 28 unaccompanied minors were identified. Of these, 12 had officially been deported into Haitian territory. L'enquête d'intentions de retour recueille des informations sur les conditions de vie des PDI dans les sites de déplacement et le retour potentiel dans leur lieu d'origine. 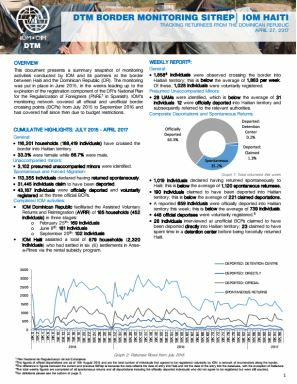 1,3645 individuals were observed crossing the border into Haitian territory from 16 to 23 March 2017. 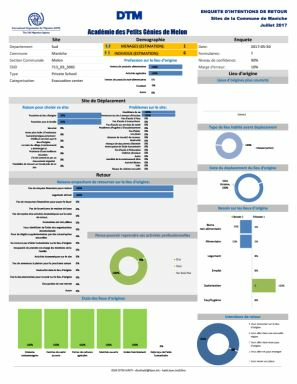 675 individuals declared having returned spontaneously to Haiti and 169 individuals claimed to have been deported into Haitian territory. Cumulatively since the first week of June 2015 to 9 March 2017, 107,914 households representing 177,304 individuals have crossed the border into Haitian territory. 33.7% were female while 66.3% were male. 2,892 presumed unaccompanied minors were identified. 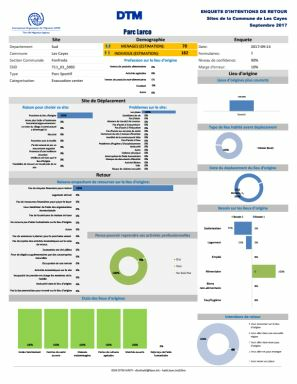 8935 individuals were observed crossing the border into Haitian territory this week, of these 33 presumed unaccompanied minors were identified. 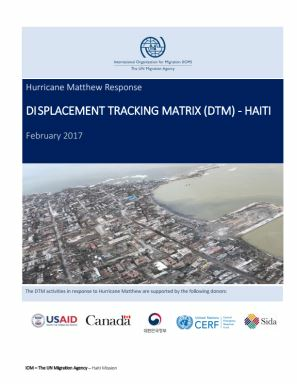 250 individuals declared having returned spontaneously to Haiti and 64 individuals claimed to have been deported into Haitian territory. 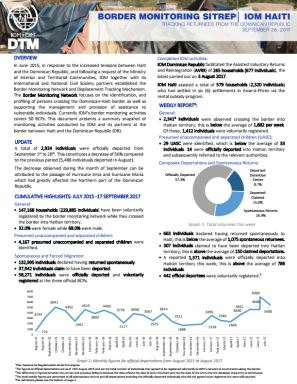 IOM recorded a cumulative total of 174,840 individuals comprising 106,241 households crossing the border into Haitian territory. 33.7% of these were female and 66.3% were male. 2,849 presumed unaccompanied minors were identified. 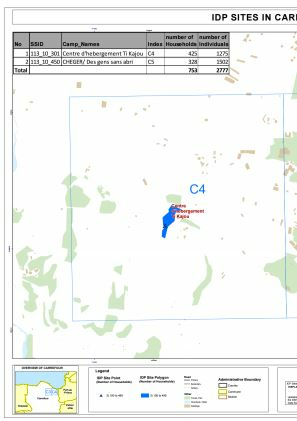 A total of 711 evacuation shelters were inventoried. 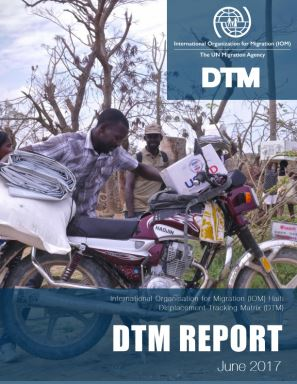 Of these, the DTM teams profiled 423 shelters and registered 79 shelters. As of 14 February 2017, 47 evacuation shelters remained open, hosting an estimated 7,015 persons (representing 1,564 households). 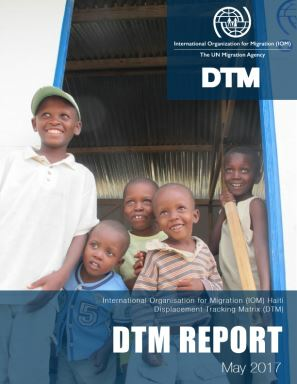 IOM recorded a cumulative total of 173,208 individuals comprising 105,070 households crossing the border into Haitian territory, 33.8% of these were female and 66.2% were male. 2,824 presumed unaccompanied minors were identified. 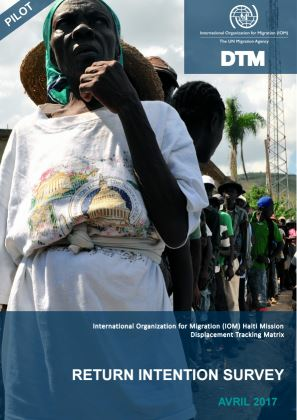 IOM recorded a cumulative total of 171,749 individuals comprising 103,923 households crossing the border into Haitian territory, 33.8% of these were female and 66.2% were male. 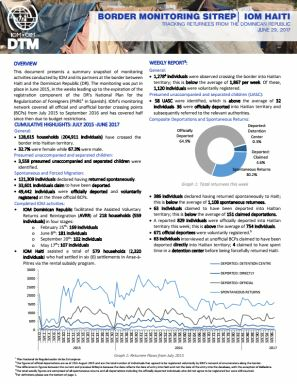 2,805 presumed unaccompanied minors were identified. 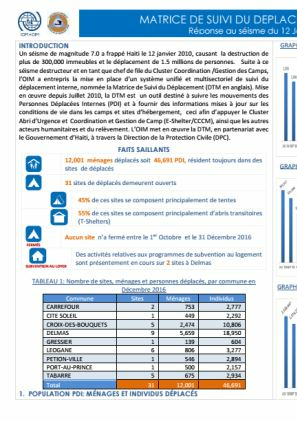 IOM recorded a cumulative total of 169,986 individuals comprising 102,733 households crossing the border into Haitian territory. 33.8% of these were female and 66.2% were male. 2,772 presumed unaccompanied minors were identified. Between 12—19 January 1,886 individuals were observed crossing the border into Haitian territory. Cumulatively from the first week of June 2015 to 26 January 2017, 101,893 households representing 168,810 individuals have crossed the border into Haitian territory. 33.9% were female while 66.1% were male. 2,744 presumed unaccompanied minors were identified.